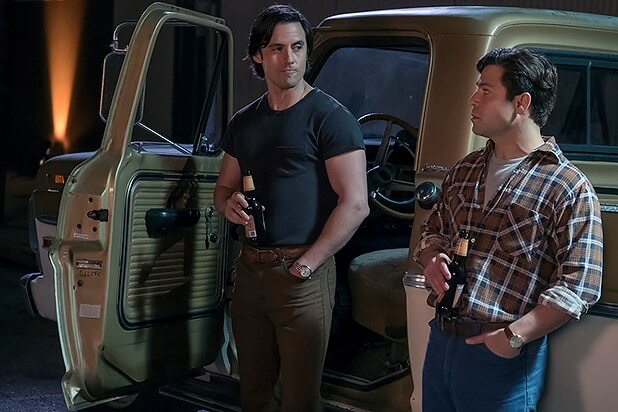 The present-day storylines on “This Is Us” feature two expanding families, and those units went through distinctly different experiences on Tuesday’s episode. The NBC drama’s latest installment featured a welcome happy moment for pregnant Kate (Chrissy Metz), as Toby (Chris Sullivan) gave her a proper marriage proposal, complete with custom-made hoodies. Meanwhile, Randall (Sterling K. Brown) and Beth (Susan Kelechi Watson) dealt with complicated emotions as Deja’s (Lyric Ross) biological mom called her daughter from prison. Series executive producers John Requa and Glenn Ficarra told TheWrap that Kate’s pregnancy will take its toll on the mom-to-be, although Toby does what he can to help her maintain a positive outlook. Kate told Toby two weeks ago about the bun in the oven, leading her beau to delightfully prance around the coffee house. According to Requa, this moment of glee was a pivotal one for the couple. “Randall and Beth’s dogged determination to make the most out of a situation that is so uncontrollable and oftentimes moving in a very negative direction — it’s pretty amazing to watch, and pretty honest,” Requa continued. “This Is Us” airs Tuesdays at 9/8c on NBC. It's hard to imagine Papa Pearson willingly leaving the family he clearly adores, but eagle-eyed fans point to Randall's words when he was trying to stop a co-worker from committing suicide at the company Christmas party: You need to be there for your kids. This would seem to come out of nowhere for casual viewers, but die-hard fans have picked up on several references to planes on the show. Why is Kate so scared of flying? Why did Kevin destroy his toy airplanes? Jack's unhealthy habits -- in addition to the drinking -- have been picked up by some fans, who believe cardiac arrest will be the cause of death, compounded by Kate's emotional response to Toby's heart issues. But honestly, this just sounds way too normal for a show that's all about throwing curveballs. This is definitely a stretch, but we know Jack borrowed money from his abusive father without revealing anything about his life or his family. Could the elder Pearson show up decades later in a rage? Uh, probably not, but that's one theory. This is the theory the show sets up as viewers watched Jack drive off to Cleveland to Rebecca as Kate's voice-over tells us she blames herself for her dad's death. That's what makes it pretty unlikely that Jack gets taken out before he's reunited with his wife. Wouldn't you agree? Okay, he probably doesn't die in a car accident in the Season 1 finale, but he could get injured -- seriously injured. So injured that he begins a downward spiral that further strains his marriage and ultimately leads to his death. And it all began when Kate convinced him to drive to Cleveland. It's not too far-fetched, plus it would keep Ventigmilia alive and kicking in flashbacks for a good while longer. This is a doozy and probably the most unlikely, but what if Jack isn't actually dead? This insane theory involves a car thief who knocks him unconscious, causing amnesia, and his oblivious father, who never knew he had a family to alert to his real whereabouts. So, Kate's been holding onto some stranger's ashes this entire time? Yikes.